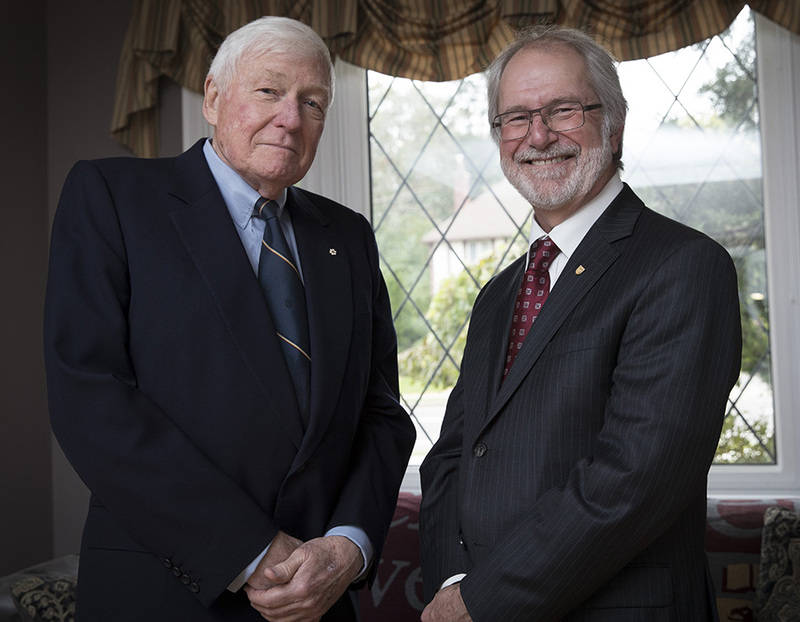 Chancellor Emeritus Lynton 'Red' Wilson, left, with University President Patrick Deane. McMaster’s longstanding commitment to liberal arts in building a strong university received another generous boost Monday with a new $2-million investment from Chancellor Emeritus Lynton “Red” Wilson. The gift launches the Socrates Project, a two-year campus-wide pilot project drawing on the University’s strengths and expertise in liberal arts education and research, especially in the study of the humanities and social sciences. Championed by McMaster President Patrick Deane, the initiative will showcase and help to foster the critical thinking, communication, creativity, imagination and collaboration critical to developing deeply engaged citizens and leaders. “We must constantly work to better understand who we are – our history, our communities, our cultures, ourselves – if we are to realize our goals and make sound decisions about our nation and our place in the world,” Wilson told the crowd of about 200 when he explained why he was excited to support the project. Wilson’s surprise gift was greeted with enthusiastic applause when President Deane announced it during a celebration to showcase L.R. Wilson Hall on October 30. “This is a wonderful new gift from someone who cares deeply about McMaster, its role in society and who has the confidence in our ability to influence the trajectories of our students, our communities and our country in building a Brighter World,” said President Deane. L.R. Wilson Hall was made possible through a $10-million gift from Wilson and a $45.5-million contribution from the provincial government. L.R. Wilson Hall: The light-filled building, situated at the corner of Forsyth Avenue and Sterling Street, includes a 350-seat concert hall and a unique “Black Box” theatre, which provides space that can be reconfigured for a variety of music, dance and spoken word productions. It features interactive, high-tech teaching and learning spaces including a 400-seat lecture theatre and two-100 seat classrooms as well as study and collaboration rooms and roof-line extended green landscaping throughout. It is home to significant research centres such as the Wilson Institute for Canadian History, the Gilbrea Centre for Studies in Aging and the McMaster Indigenous Research Institute. The Indigenous Studies program and Indigenous student support offices, with a distinct ceremonial room and traditional Indigenous garden, are located on the building’s first floor. L.R. “Red” Wilson: Wilson is a distinguished Canadian, retired public servant and business executive and proud McMaster alumnus who graduated in 1962 with an economics degree. He served as chancellor from 2007 until 2013. He has also served on the Board of Governors and chaired McMaster’s Changing Tomorrow Today fundraising campaign. His previous philanthropic giving to McMaster includes gifts to create the Wilson Institute for Canadian History, the L.R. Wilson Chair in Canadian History and the L.R. Wilson/Bell Canada Chair in Data Communications. In 2015, the Wilson Foundation established the Wilson Leadership Scholar Awards, hosted at McMaster, which are designed to cultivate the country’s next generation of leaders. The Socrates Project: The project takes its name from the ancient Greek philosopher credited with creating and codifying the enquiry method (known as the Socratic method) – specifically asking and answering questions – to solving problems. McMaster’s longstanding commitment to liberal arts in building a strong university received another generous boost Monday with a new $2-million investment from Chancellor Emeritus Lynton “Red” Wilson. The gift launches the <strong>Socrates Project</strong>, a two-year campus-wide pilot project drawing on the University’s strengths and expertise in liberal arts education and research, especially in the study of the humanities and social sciences. Championed by McMaster President Patrick Deane, the initiative will showcase and help to foster the critical thinking, communication, creativity, imagination and collaboration critical to developing deeply engaged citizens and leaders. “We must constantly work to better understand who we are – our history, our communities, our cultures, ourselves – if we are to realize our goals and make sound decisions about our nation and our place in the world,” Wilson told the crowd of about 200 when he explained why he was excited to support the project. “The Socrates Project is compelling particularly because of its mandate to be inclusive, cross boundaries and make connections between science and the arts.” The initiative comprises five thematic areas: <ul> <li><strong>Spotlight on the Arts</strong>: activities such as concert series, theatre, art exhibits and other presentations that highlight performance and critique and will capitalize on the leading edge space in L.R. Wilson Hall, the new home of the liberal arts at McMaster</li> <li><strong>Socratic Occasions</strong>: high quality academic discourse featuring leading speakers, debates, lectures and seminars</li> <li><strong>Interdisciplinary Programs and Outreach bringing together students from diverse programs and Faculties</strong>: enabling McMaster students to collaborate and partner on topics outside their primary fields of study and academic programs</li> <li><strong>Local and Global Engagement</strong>: opportunities for students to become involved in public service and community engagement through course and volunteer work at home and abroad</li> <li><strong>Fashioning the Future</strong>: providing leadership development through dedicated activities and programming</li> </ul> Wilson’s surprise gift was greeted with enthusiastic applause when President Deane announced it during a celebration to showcase L.R. Wilson Hall on October 30. “This is a wonderful new gift from someone who cares deeply about McMaster, its role in society and who has the confidence in our ability to influence the trajectories of our students, our communities and our country in building a Brighter World,” said President Deane. L.R. Wilson Hall was made possible through a $10-million gift from Wilson and a $45.5-million contribution from the provincial government. “McMaster is grateful for the Ontario government’s significant investment that helped us develop this inspiring building,” President Deane said. “I extend the many thanks of an appreciative McMaster community.” <h3><strong>Did you know?</strong></h3> <strong>L.R. Wilson Hall</strong>: The light-filled building, situated at the corner of Forsyth Avenue and Sterling Street, includes a 350-seat concert hall and a unique “Black Box” theatre, which provides space that can be reconfigured for a variety of music, dance and spoken word productions. It features interactive, high-tech teaching and learning spaces including a 400-seat lecture theatre and two-100 seat classrooms as well as study and collaboration rooms and roof-line extended green landscaping throughout. It is home to significant research centres such as the Wilson Institute for Canadian History, the Gilbrea Centre for Studies in Aging and the McMaster Indigenous Research Institute. The Indigenous Studies program and Indigenous student support offices, with a distinct ceremonial room and traditional Indigenous garden, are located on the building’s first floor. <strong>L.R. “Red” Wilson</strong>: Wilson is a distinguished Canadian, retired public servant and business executive and proud McMaster alumnus who graduated in 1962 with an economics degree. He served as chancellor from 2007 until 2013. He has also served on the Board of Governors and chaired McMaster’s <em>Changing Tomorrow Today</em> fundraising campaign. His previous philanthropic giving to McMaster includes gifts to create the Wilson Institute for Canadian History, the L.R. Wilson Chair in Canadian History and the L.R. Wilson/Bell Canada Chair in Data Communications. In 2015, the Wilson Foundation established the Wilson Leadership Scholar Awards, hosted at McMaster, which are designed to cultivate the country’s next generation of leaders. <strong>The Socrates Project</strong>: The project takes its name from the ancient Greek philosopher credited with creating and codifying the enquiry method (known as the Socratic method) – specifically asking and answering questions – to solving problems.